While water-powered fire suppression systems are intended to protect, they can cause damage! Clean agent fire suppression systems, on the other hand, deploy swiftly and do not leave behind oily residue, particulate, or water that can damage irreplaceable assets. If you are looking to protect as much property as possible, consider installing a clean agent fire suppression system. Are you looking to install, maintain, or repair a clean agent fire suppression system? Call our fire protection company at 866-308-5701! State Systems Inc. is a licensed provider of clean agent fire suppression systems, including FM-200 and carbon dioxide systems. We also install Kidde, Ansul Sapphire, and Ansul Inergen fire protection clean agent systems. Our team of experienced and licensed fire protection technicians also offer repair, maintenance, testing, and recharging services throughout the Mid-South. Call us at 866-308-5701 or contact us online for more information or to request an estimate. If you’re looking to protect your data center with fire suppression services, you’ve come to the right place. Why? Installing a fire suppression system with us will help you to automatically extinguish a fire in your server room or data center without needing to rely on human intervention. Your data center has special fire suppression needs, and you need to know them to add the best layer of protection. If you have any questions about installing a clean agent fire suppression system for your data center or server room, call 866-308-5701! The FM-200 fire suppression system is one of the most well-recognized and respected clean agent fire suppression systems in the world today. The best feature of this system is that it can reach extinguishing levels in 10 seconds or less, which allows the FM-200 to halt combustible, electrical and flammable liquid fires before they cause any harm to your workers or major damage to your valuable assets. Not only do you provide an important layer of safety to your workers by installing the FM-200 fire suppression system, but you will also save on repair costs in the case of a fire. If you operate a business in tight quarters with limited space, you’ll be pleased to know the FM-200 is an excellent clean agent fire suppression system for you. 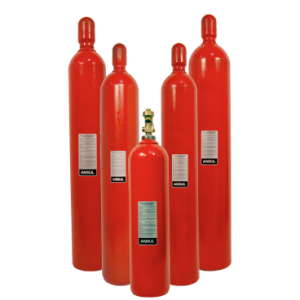 The FM-200 agent is stored in cylinders as a liquid and pressurized with nitrogen, which makes for a highly compact fire suppression system. We install and service Kidde FM-200 fire suppression systems! For more information, call State Systems Inc. at 866-308-5701! In addition to the FM-200 suppression system, State Systems Inc specializes in the installation of Cabon Dioxide fire suppression systems. We’ll properly install a CO2 fire suppression system for your business space, which will safeguard your sensitive electronic equipment, data room, manufacturing equipment, file room, etc. against fires. Since CO2 is a gas, it does not leave behind water, foam or dry chemicals that can damage your sensitive property. These clean agent fire suppression systems take advantage of the extremely high density of carbon dioxide to quickly and effectively suppress fires. These systems are completely safe and can be found in today’s industrial plants, commercial facilities and even aboard ships. We install and service Kidde and Ansul CO2 fire suppression systems! For more information call 866-308-5701! State Systems Inc is proud to offer the new standard for Halon replacement. ANSUL Sapphire fixed nozzle, fire suppression systems use 3M Novec 1230 fire protection fluid for total flooding applications. The agent has 0.0 ozone depletion potential, an atmospheric lifetime of just five days, and a global warming potential of 1.0. Every Sapphire system is custom engineered for the specific application using the most effective, yet efficient arrangement of storage, actuation, distribution, and discharge components. The Sapphire system is excellent because it utilizes a revolutionary fire protection fluid, which looks exactly like water—but does not cause the type of damage associated with water when putting out a fire. The system provides the ideal solution for hospitals, museums, libraries, telecommunications centers, and other facilities throughout the Mid-South seeking to protect critical assets that could be damaged by ordinary fire suppression systems. ANSUL Inergen systems protect enclosed areas where there is a need for quick reaction to a fire, where people may be present, where fire may strike day or night, and where damage from conventional agents cannot be tolerated. The Inergen extinguishing clean agent used in ANSUL engineered systems is particularly useful for hazards where an electrical, nonconductive medium is essential or desirable; where clean-up of other agents presents a problem; where hazard obstructions require the use of a gaseous agent; or where the hazard is normally occupied and requires a non-toxic agent. Call us or contact us online to learn more about the ANSUL Inergen Fire Suppression System. Call State Systems Inc. at 866-308-5701! To find out more about the clean agent fire suppression systems we install, or for a quote, contact us online or call 866-308-5701.